For the past few months, the DJI Mavic Air has been arguably the best compact drone you can buy. It’s super small, the video quality is better than the original Mavic Pro, and with all of the new QuickShot modes it was great for beginners. Now things are changing. Now the Mavic 2 Pro is out and promises a whole array of new features, but is it worth the upgrade? If you’re not sure which one to buy, this is the article for you! We’re going to go over all of the most important aspects of each drone, and at the end, you should have all of your questions answered. Well.. you should at least have most of your questions answered! I was using a beta version of the DJI Go 4 app and drone firmware, so I wasn’t able to test out every single new feature of the Mavic 2 Pro, but everything important was tested and works just like DJI said it would. Before getting into the technical stuff, we need to talk about the most obvious difference. The Mavic 2 Pro has a great design. It’s sleek, the build quality is solid, and it comes with the silent propellers that make it quieter, and the bright lights make it easy to tell what direction you’re facing even when far away. And it has crazy bright LED lights on the bottom for helping the downward facing sensors see the ground at night. More about that later. There are some drawbacks to the Mavic 2 Pro design, and one of them is how large it is when unfolded. Yes, you can fly it indoors thanks to the vision positioning system, and DJI even offers propeller guards if you need them, but it’s scary to fly in small spaces. It isn’t the kind of drone I would try flying through windows or doorways. The design of the Mavic Air is completely different from the Mavic 2 Pro. It’s like if you combined the Mavic 2 Pro, the Spark, and a sports car together. 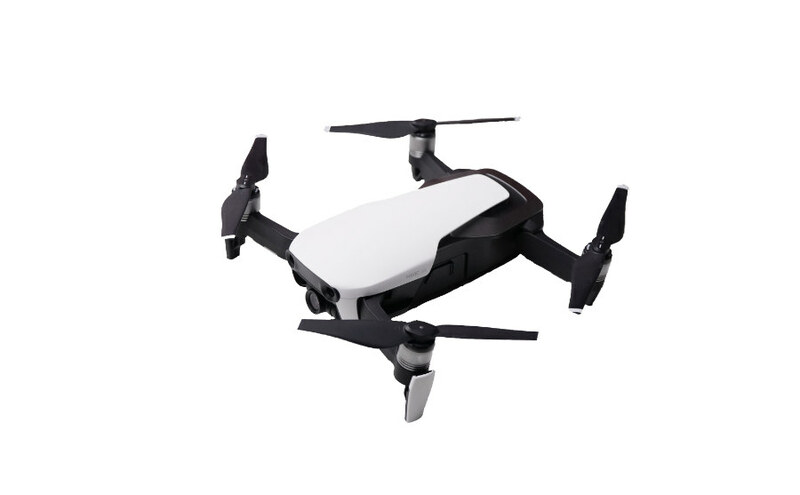 It has a very small and clean looking shell like the Spark while still maintaining the folding design of the Mavic 2 Pro. The lines on the Mavic Air are super clean and well thought out, where as the Mavic 2 Pro looks a bit more robotic and blocky. The new Mavic 2 Pro is a bit cleaner and sleek in design compared to the old Mavic Pro, but still bulkier than the Mavic Air. The best part about the design is the new Spark inspired camera and gimbal. It’s a lot more compact and sturdy. Although I wouldn’t want to crash any drone, the Mavic Air seems like it would hold up pretty well. One thing that’s strange is the propellers that don’t fold. This might seem like a drawback at first, but unlike other folding drones the props don’t stick out from the body, and the cleaner design probably helps achieve more flight time. Ok.. Let's continue with the current article. Let’s talk about memory and SD cards. Both the Mavic Air and the Mavic 2 Pro have built-in microSD card slots that can handle 128 gigabytes. That’s great because you can fit a lot of high quality video on there. Also, they both have their own built in memory! It’s only 8 GB, but I can’t tell you how many times that would have saved me when I got to a location only to realize that I either forgot to bring my memory cards, or the one I have was damaged or full. There is an obvious overall size difference between the Mavic Air and the Mavic 2 Pro. The Mavic Air is roughly half the physical size of the Mavic 2 Pro, and it’s about 53% lighter. If you want to know the exact specs, well the Mavic 2 Pro is 907g, and the Mavic Air is 430g. This has some obvious advantages. If you look all over the web, you’ll see all sorts of photos of the Mavic Air showing off its small size next to everyday ordinary objects. It can fit in pockets, bags, and backpacks easily, making it super travel friendly. That also allows for you to get spontaneous footage that you may never have had the chance to get if it weren’t for the fact you just happened to have your drone in your coat pocket! After all, some of the best footage was not planned. It was real life in the making. One more thing that doesn’t really have to do with size but it has a lot to do with portability which go hand in hand is the fact that the gimbal on the Mavic Air is completely housed inside the body of the drone. So when you do throw it in your backpack, it is automatically protected without needing to put it into a protective case. And, it even comes with a snap on cover for the gimbal/camera to protect the lens from getting scratched and the gimbal from sloshing around. The new Mavic 2 Pro has a much improved gimbal design as well that should prove to be a bit more sturdy. The difference between the Mavic Pro and Mavic Air propellers is huge. The Mavic Air has non-foldable 133mm props with a very thin design. If you don’t like the Mavic Air props, there is one other secret propeller option, but that’s a story for another article. The Mavic 2 Pro propellers come in at 220mm and are much wider, however they are only 100mm when folded. For some people, sound is very important, so here are two high quality audio recordings of each drone. This test was done with the mic held about 3 feet behind the drone and the mic gain set to manual so you can get an idea of what these two drones really sound like. The first recording is the Mavic Air, and the second is the Mavic Pro with Platinum propellers. We haven’t done an actual audio test with the new Mavic 2 Pro yet, but the sound of the old Mavic Pro and the new Mavic 2 Pro should be almost identical. The Mavic Air sounds like a swarm of angry bees. It's a similar sound to the Spark. The Mavic 2 Pro sounds more like an airplane. Due to the larger size, it produces a much lower pitch tone that is much quieter. The Mavic 2 Pro propellers make the noise level even lower than the old Mavic Pro even with the platinum propellers. Both the new Mavic 2 Pro, and the Mavic Air stay pretty cool due to a design feature that allows air to enter the drone from behind the gimbal, and exit through vents in the back of the drone. It passes through the drone, past a heatsink, and does a good job of dissipating all that heat. 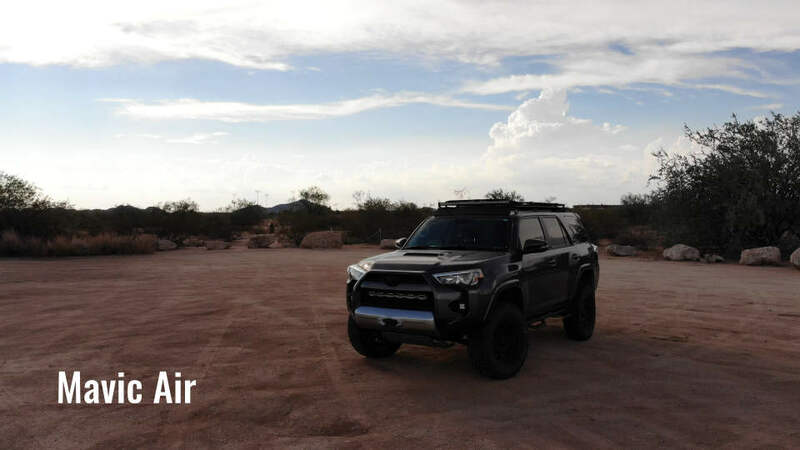 Heat may not be a problem in cooler climates, or on short runs, but out here in the desert, especially while not moving, things can get pretty hot pretty quickly! Both the old Mavic Pro and the Spark sometimes had shut-down issues due to excessive heat build-up, so this feature prevents that from happening to the Mavic Air and the new Mavic 2 Pro. The Mavic 2 Pro will go over 45mph, but the Mavic Air can go pretty fast too, around 40mph. Many people would end the comparison there, but that wouldn’t tell the full story. The max Speed in sport mode is only one measurement, but the real maximum speed will change depending on how you’re flying. This is why we tested the max speed in almost every situation we could think of (not just Sport mode). When obstacle avoidance is on, the Mavic Air will only go 20mph. The Mavic 2 Pro blows past that at almost 30mph. That means you won’t have to disable obstacle avoidance on the Mavic 2 Pro for most shots. Gimbal speed is another thing that most people don’t talk about. While the Mavic Air can go up to 40mph, that doesn’t mean that you will be able to look straight ahead at that speed. The Mavic Air has a gimbal design that is closer to the Spark, and because of that it has a very limited range of motion. You can only go about 20mph in any direction before the gimbal reaches its limit. Once it does, the camera will abruptly start pointing down until you reduce your speed. The only way of going faster while still looking forward is to fly backwards. This really limits the kind of shots you can do when you need to go fast. 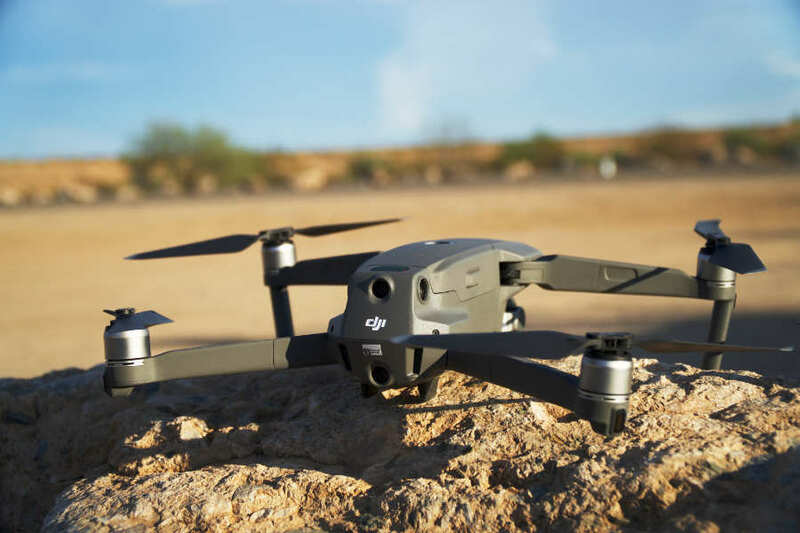 The Mavic 2 Pro starts to tilt the camera down at 40mph when going forward, however when you’re flying sideways you can go up to 45mph without the gimbal reaching its limit. This is a really big deal for me, especially since I like to get shots of moving vehicles. Flight time is not a very easy thing to measure due to environmental factors, but on the old Mavic Pro, hovering indoors we got 23 minutes and the Mavic Air was not too far behind at 18 minutes. 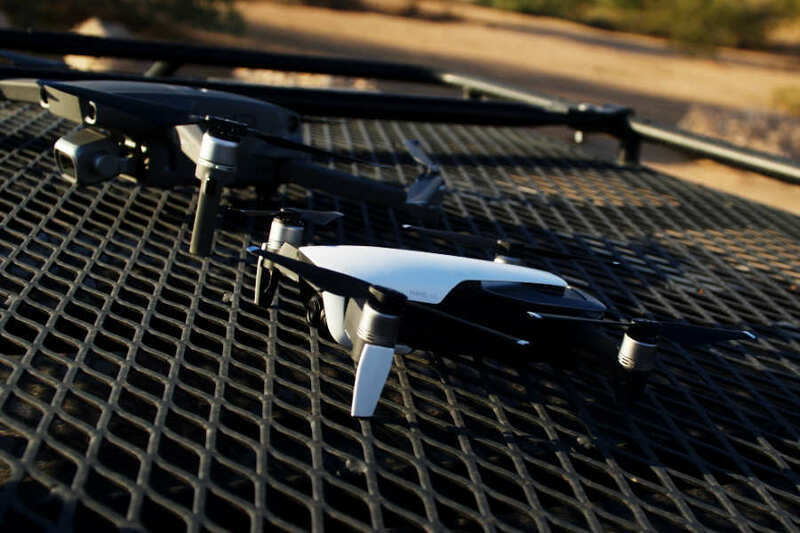 Both drones were tested with a battery level of 100% and drained down to 5%. The new Mavic 2 is supposed to get 31 minutes of flight time with no wind, a little better than the old Mavic Pro, but we haven’t tested it out yet so we’ll let you know what our actual results are. You could have the fastest drone in the world with unlimited flight time, but if the video quality is bad, it’s useless. There are a few different features that make the Mavic 2 Pro better for shooting video than the Air. Some of these things are minor and others are really big improvements. If you like to shoot slow motion video, both drones can now shoot 1080p video at 120fps (the old mavic Pro could only do 96fps). For me, slow motion is nice to have, but I don’t use it often because the quality just isn’t all that great. The main reason for this is because the bitrate of the video doesn’t change when the frame rate goes up, so you’re essentially lowering the amount of data that’s in every frame of video. In 1080p at 120fps for example, you would have 5 times less information in each frame compared to footage shot in 24fps. The colors on the Mavic 2 Pro are much more realistic than the Mavic Air. 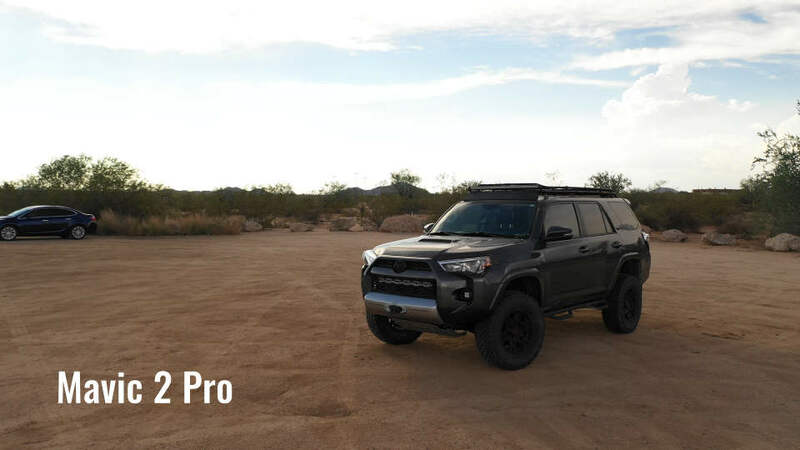 Looking at this photo of a 4Runner in the desert shot in the normal color profile, you can see that the Mavic Air makes the dirt look more red when it should be completely brown like on the Mavic 2 Pro. Another thing you will notice is that all of the Mavic 2 Pro shots were over exposed. I had both drones set to manual exposure and used the same settings for each of them, but it looks like the Mavic 2 Pro lets in a little more light than the Mavic Air. If I would’ve exposed the scene properly, you would be able to see that the Mavic Pro has slightly more dynamic range in the standard color profile than the Mavic Air. One complaint I have with the Mavic 2 Pro is the lack of a D-Cinelike profile. I’m guessing they removed this option because the colors of the old profile weren’t good enough for the new Hasselblad camera, but it would be nice to see an updated version of D-Cinelike in the future for those times when you don’t want to shoot in a color profile like log that will be harder to color correct and grade. The good news is, when you shoot in the new Dlog-M color profile on the Mavic 2 Pro it’s actually pretty easy to grade. It isn’t too flat like some log profiles, but the dynamic range is great (way more than D-Cinelike on the Mavic Air). 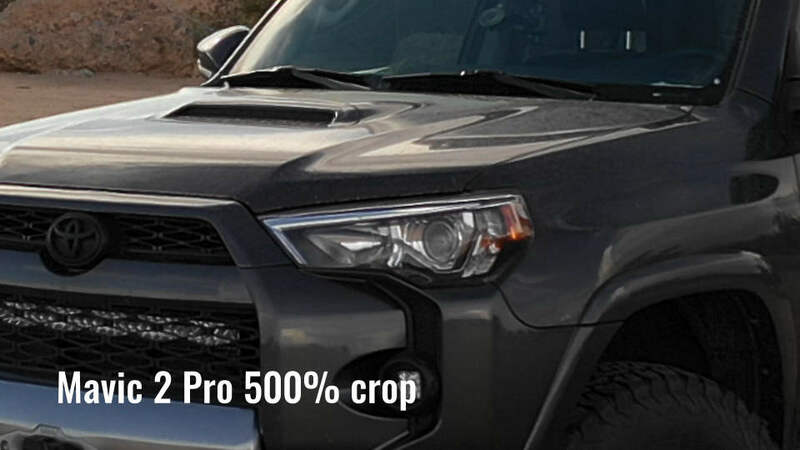 In this example you can see how the Mavic 2 Pro looks when you use the 4K crop mode that uses a smaller portion of the image sensor to achieve a 1.4X crop in 4K. On the Mavic Air, you don’t get any zoom, so you’re stuck with the wide angle lens. This is fine for landscape filming, but if you really want to separate your subject from the background, having the option to zoom in is great. Here you can see how Dlog-M and D-Cinelike footage look after color correction and color grading is applied. Both shots used roughly the same color grade, but you can see a big difference in the dynamic range on the Mavic 2 Pro. Also, the zoomed in look makes all of your shots look even more cinematic. To me, the Mavic 2 Pro seems a bit sharper than the Mavic Air, but it’s not a huge difference. The bigger advantage that you get with the Mavic 2 Pro is the H.265 video codec. H.265 allows you to get the same quality as H.264 but using half as much data. This means with H.265 it’s more like shooting at 200Mbps instead of 100Mbps, so you will see much less compression artifacts in the Mavic 2 Pro videos. One thing that you do have to worry about when shooting with the mavic 2 Pro is the aperture and focus. On the Mavic Air, all of your shots will always be in focus because the lens doesn’t have focus control, but on the mavic 2 Pro that’s a different story. You need to make sure that all of your shots are in focus since the lens doesn’t have a fixed focus distance. Also, changing the aperture number (F-stop) can effect how sharp the image is. at F11 for example, things will be softer than F4, so you may want to use ND filters or change the shutter speed instead of changing the aperture if you need as sharp of an image as possible. The Mavic Air camera does a lot of things right, but after seeing this test, you should start to notice that the Mavic 2 Pro blows the Air away (no pun intended). At ISO 100, there’s not a huge difference other than the colors. Once you get to ISO 800, that’s where the Mavic Pro really starts coming out on top. At ISO 3200, I wouldn’t consider the footage from the Mavic Air to even be usable. I also noticed a strange effect on the Mavic Air. 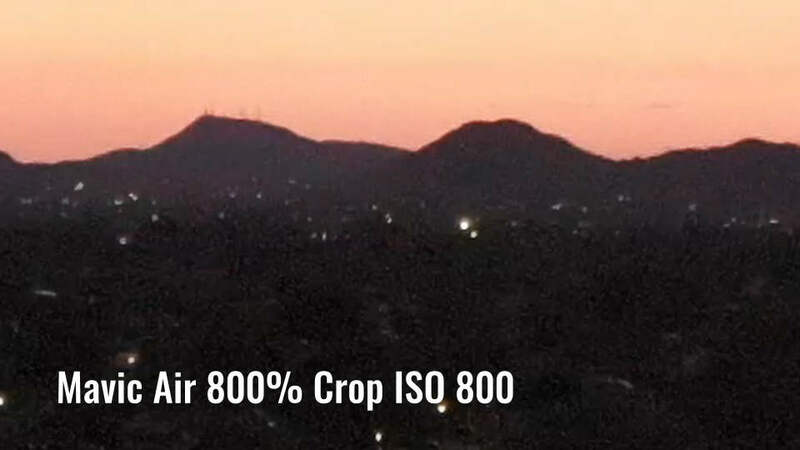 In the Higher ISO ranges, the Mavic Air made the corners of the image darker even though the exposure was set in the same way for both drones. Looking at these results it’s easy to see the winner, but one thing you should remember is that all of these tests were done using the Mavic 2 Pro (not the Zoom model) so naturally it’s going to have better low light capability because of the larger sensor. 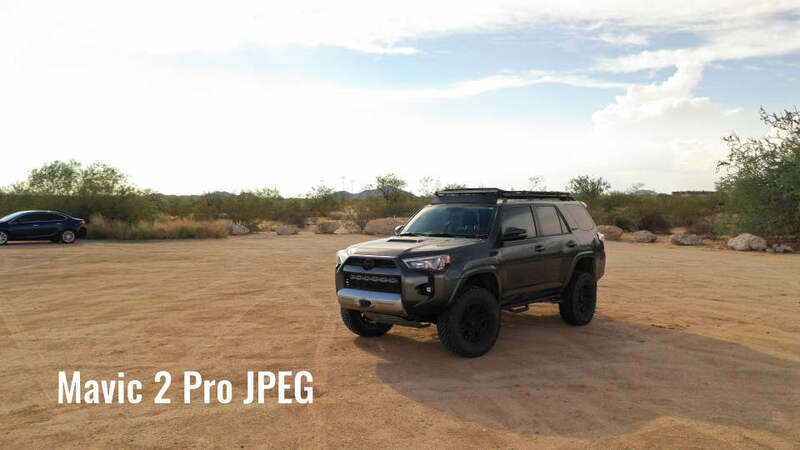 The JPEG Images on both drones look very similar to videos shot in the standard color profile. The Mavic Air is usually a bit red and the Mavic 2 Pro just looks great with no real issues from what I can see. Sharpness on the Mavic 2 Pro is obviously going to be much better for images because of the 20 megapixel sensor. The RAW files don’t start out looking great (no raw files do), but once you do some editing, they definitely come out looking better than the JPEG photos. One thing that’s great about shooting in RAW is that you don’t have to worry about getting a perfect exposure. 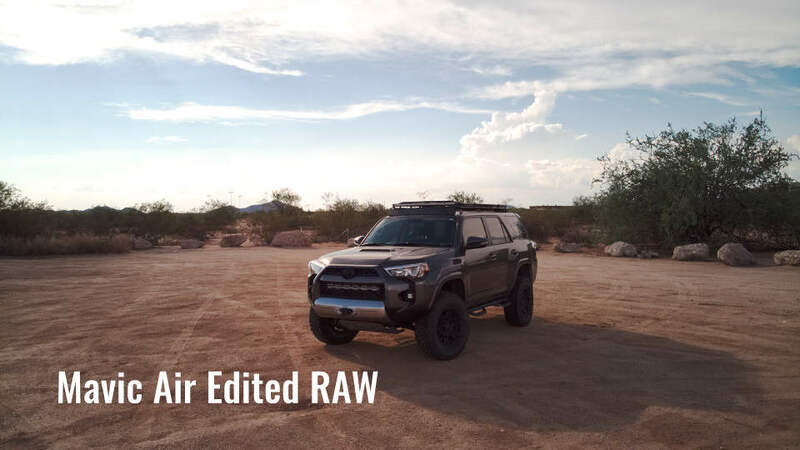 Since it’s raw, you can fix things like exposure, white balance, and even bring back highlights and shadows that may have been lost in a JPEG image “even if you properly expose it”. Ariel photography is not something I do everyday, but if I am taking pictures, I’m usually doing HDR photography. 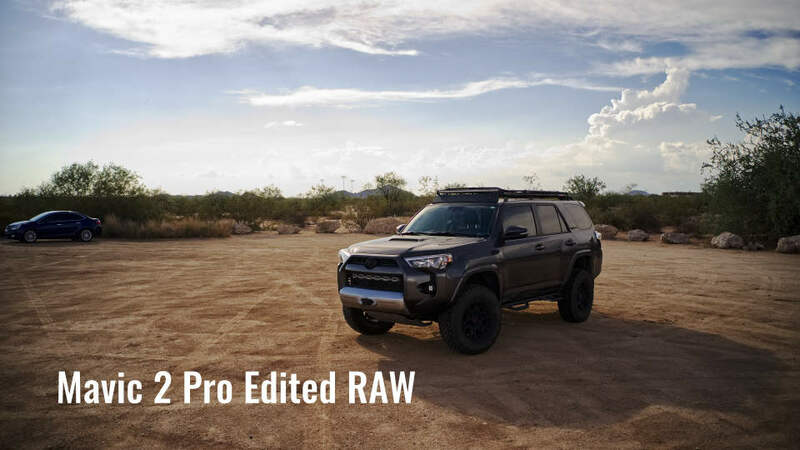 High dynamic range photos can look amazing if you know how to edit them. We were going to test out the new D-HDR mode and do a comparison to the old HDR mode, but unfortunately it wasn’t currently supported in the beta software that we had. 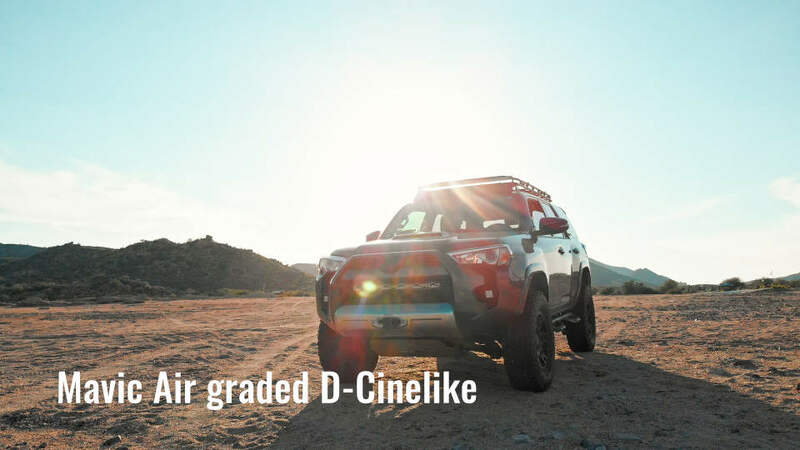 The D-HDR mode should give you much more detail in the highlights and shadows of your images. 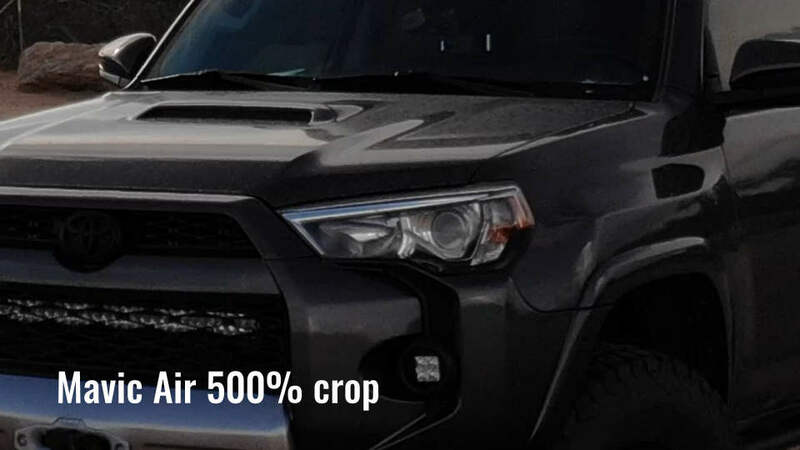 There should also be less artifacts because the faster image processor is able to capture 7 raw images and use the different frames to reduce artifacts like noise and motion blur. If you want to do better HDR photos on the Mavic Air, or you just want more control over the look of your HDR shots on the Mavic 2 Pro, there’s another mode for that. The AEB (auto exposure bracketing) mode is for doing the same thing as HDR mode but with much more work involved. In this mode, the drone will shoot multiple images at different exposures in your choice of JPEG or Raw. 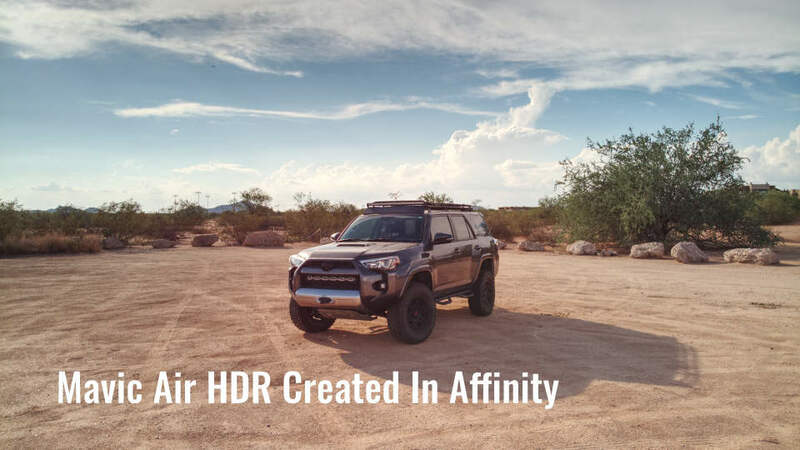 Once you get the photos off of the SD card, you can then bring them into Affinity Photo or Photoshop to create your custom HDR photos. In Affinity Photo, I just went into the file menu and selected New HDR Photo Merge. 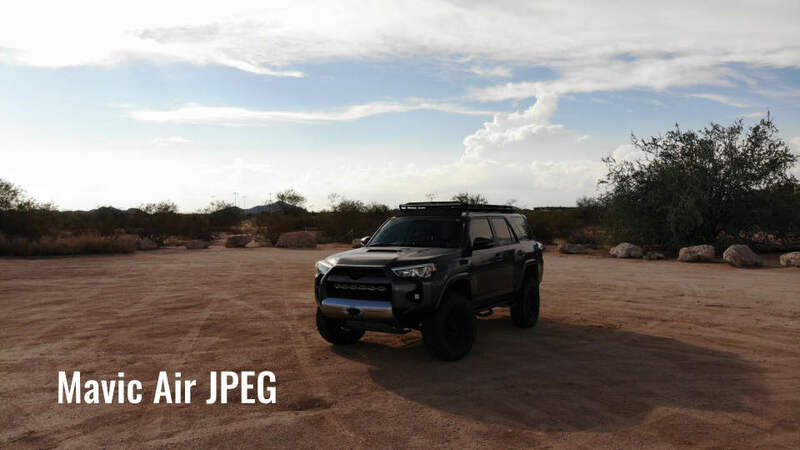 From there, you can add all of the photos you want to merge and hit the go button. The first image was shot with the Mavic Air. You can immediately see how cool HDR images can look with just a little bit of editing. This next image is from the Mavic 2 Pro. I personally like how this one came out more than the Mavic Air. 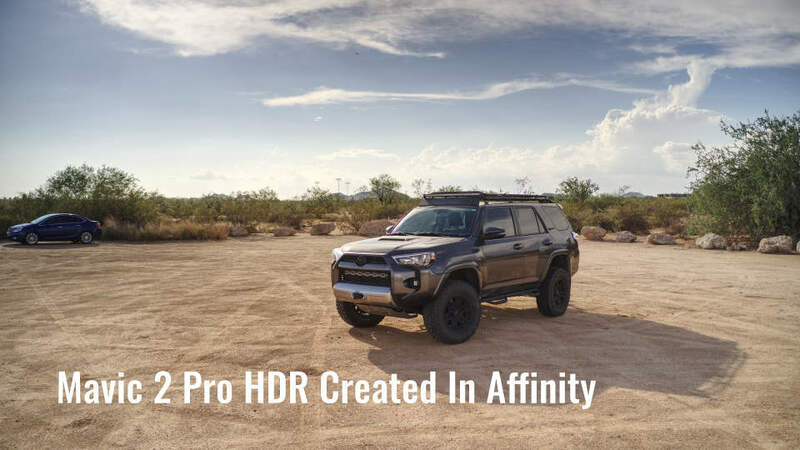 No matter which photo you like better, the point here is that using the AEB mode is a much better option than shooting HDR if you don’t want the drone to decide how the image should look. The Mavic 2 Pro has all of the panoramic modes that the Mavic Air has, but there is one big difference. Both drones can shoot 360° panoramic images and you can view them in the app, but the Mavic 2 pro has a much better image sensor for capturing higher resolution panoramas. 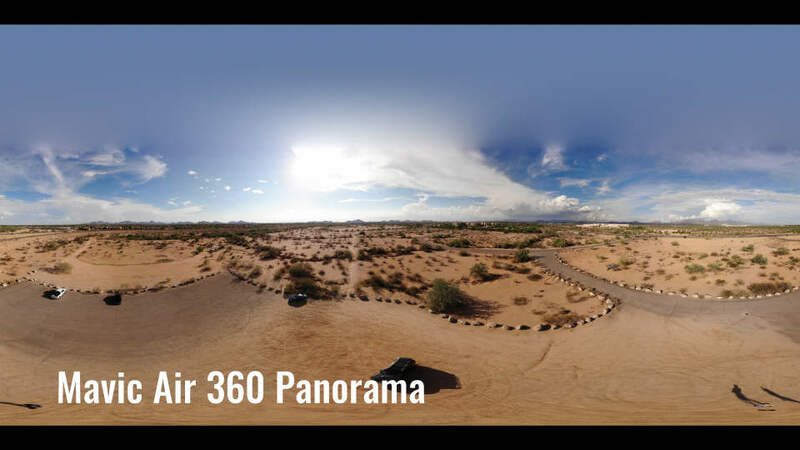 There are two ways of doing 360° panoramas. The easiest way is to let the drone do all of the processing which saves you tons of time and produces some pretty good results. The second way is to take the photos and save them as RAW files for processing later in a photo editor. This first panoramic image is an example of what it looks like when you view the panorama in the DJI Go 4 app. 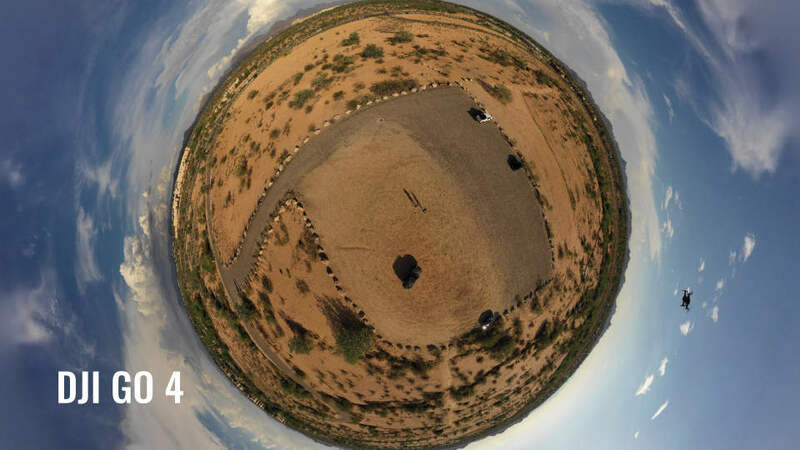 The actual photo is just a standard image file, but the app uses a technique called Equirectangular projection so you can pan around and view the image as if you were actually there. This next photo is from the Mavic Air. This is what the images look like when you export them into a standard photo program. Here’s a panoramic shot from the Mavic 2 Pro. Just like all of the other test shots, you can see that the Mavic 2 Pro renders more accurate colors. With both drones, you’re getting a 4096x8192 image when you use the built in image processing. That’s over 33 megapixels (8K). This makes a huge difference in what the images look like. The resolution is so high that you can crop in and see almost all of the detail that you would in a normal photo. 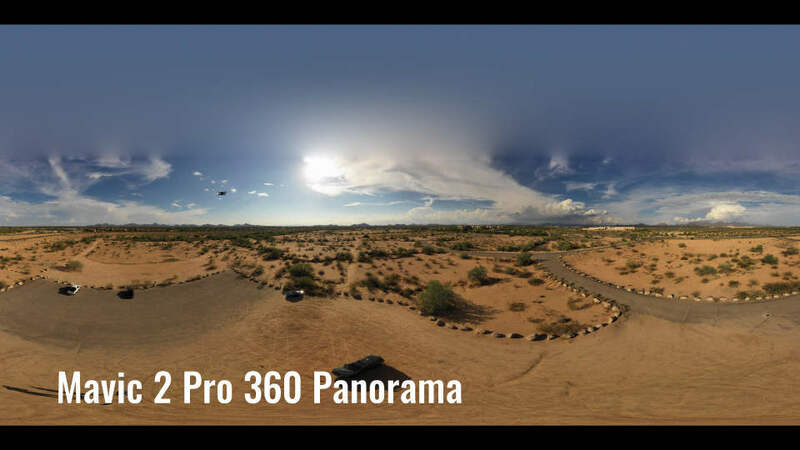 The panoramic mode on both of these drones is great, but you can also use a photo editor to generate an even higher resolution image since the built-in panoramic mode on the drone maxes out at 33 megapixels. If you want to do this, just tell the drone to save out RAW files for every panoramic shot that it takes. This way, you can import and stitch all of the images together in Photoshop. The new Mavic 2 Pro has a lot of cameras for obstacle avoidance! There are two front-facing cameras that it uses for forward obstacle avoidance. There are also two downward-facing cameras for avoiding obstacles while landing. The biggest improvement over the old Mavic Pro is the addition of two new rear-facing cameras, and a side-facing camera on each side. This will make flying backwards and sideways much safer. And icing on the cake, it even has a top-facing sensor! All these cameras send data to a special processor on the drone so it can build a 3D map of its environment. Obstacle avoidance on the Mavic 2 Pro is active in almost every mode with the exception of Sport Mode. From my experience, obstacle avoidance works very well. And with all these new sensors on the new Mavic 2 Pro, it should work flawlessly. It will sense and avoid anything thicker than a small tree branch, and now even in backwards, upwards and sideways mode! It’s what everyone has been dreaming of, and now it has come true. The Mavic Air has two front-facing cameras, two rear-facing cameras, and two bottom facing cameras. This means you can fly backwards without fear that the drone will smash into anything! You will still need to be careful flying sideways and upwards because there are no sensors for that. It’s still truly amazing that they were able to fit a total of 7 cameras on this drone and still make it much smaller than the old Mavic Pro and the new Mavic 2 Pro. There’s one other feature that used to make the Mavic Air really unique when it was released—APAS (Advanced Pilot Assistance System). APAS is a feature that you can activate on the main flight screen. While flying forward, instead of stopping when an obstacle appears, the Mavic Air will fly left, right, or up to avoid it and then keep going instead of just stopping cold like the old Mavic Pro. So far, APAS has worked every time I’ve used it. Usually, if I tried flying it into myself it would go left or right, but if I was far away and the drone was going faster, it tended to fly up. It seems to fly left or right when it has confidence about what it’s seeing, fly up when it is less confident, and stop if it can’t see what is above the obstacle it’s avoiding. Even though I’ve had drones for more than 5 years and never crashed while flying forward, I still really like this feature. With the old Mavic Pro, sometimes I had to turn obstacle avoidance off when flying close to the ground because it would sometimes stop in the middle of a great shot, but with APAS it will just fly up slightly. The great news is DJI has included APAS with the new Mavic 2 Pro so now you won’t have the problem of stopping cold like the old Mavic Pro. When the Spark came out, using the gesture mode for the first time was amazing, but it still had a few drawbacks and felt like a gimmick. The old Mavic Pro had gesture controls too. In gesture mode, the old Mavic Pro could see you and take pictures when you made a frame with your hands. I know this wasn’t very exciting, but it showed that even in the past back when the Mavic came out, DJI had big plans for gesture control even though the hardware just wasn’t ready at the time. The Mavic Air was DJI’s third drone to come out with gesture controls, so it was a bit like gesture mode 3.0 with all new functionality. I guess that’s why they called it “Smart Capture” in the DJI Go 4 app. 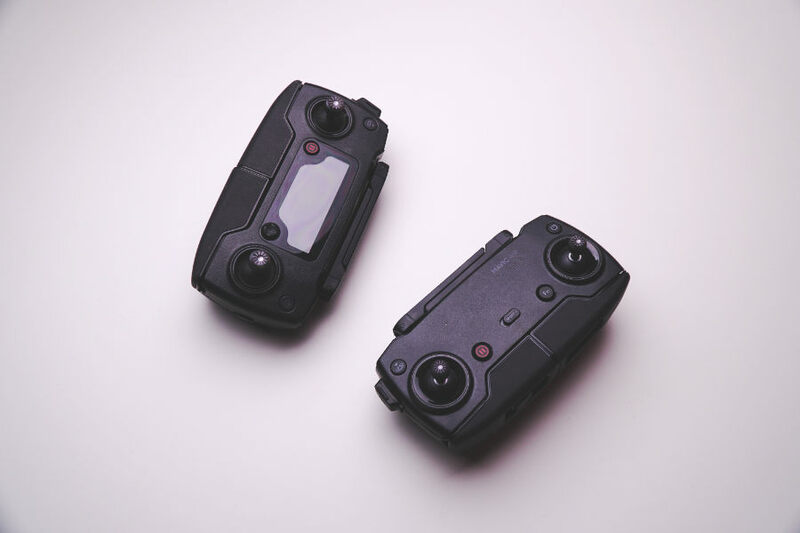 DJI has included gesture control with the new Mavic 2 Pro, but so far, it appears to be the same as the old Mavic Pro with no new features. I guess they felt that a drone enthusiast that would purchase a prosumer drone of this caliber wouldn’t appreciate the somewhat gimmicky feature as much as having things like extra cameras for obstacle avoidance, and better camera features. After all, you can’t have everything. With the Mavic Air, instead of holding it like you would with the DJI Spark, you place it on the ground and double press the back facing LED light. At this point, You’ll hear a tone indicating that the Mavic Air is in Smart Capture mode. To take off, stand back by about 8 feet so that the camera can see you, then hold your palm out in front of the drone. Once it can see your hand, it will start hovering. To land, you just put your hand out and lower it until the drone starts landing. Controlling the Mavic Air in Smart Capture mode is super easy. Hold your hand out and it will start tracking you. If you put your hand down and start moving, it will follow you around (just like Active Track). While the drone is following you, at any point you can put your hand up and it will enter into palm control mode. When in palm control mode, you can move your hand in any direction and it will fly there. Another flight related gesture is Zoom. By putting both of your hands out and moving them closer and farther away, you can precisely control how far away the Mavic Air is. Taking pictures and videos with Smart Capture is also super easy. It also works much better than the DJI Spark. To record video, put your thumbs and index fingers together in the shape of a picture frame. The front LEDs will turn off while recording. To stop the recording, just make another picture frame with your hands and the LED lights will come back on. To take a picture, hold up two fingers (like rabbit ears). The LEDs should flash indicating a 3 second countdown, and then take the picture. If you’re flying around using Smart Capture and someone else wants to try controlling the Mavic Air, just make sure your arms are down, then have the new user hold their hand out. The best part about Smart Capture is how fast the Mavic Air responds to your commands. While using palm control, the Mavic Air moves around quickly and precisely. You can move your hands much faster than you could with the Spark, and if the drone does lose you, standing in view of the camera and waving your hand will quickly cause the drone to start tracking you again. The new Gesture mode is no longer a gimmick. Before it was only something I used when I was showing other people features of the drone, but now It feels like something I would actually use. Now if I want to take some quick tracking videos of myself, I can do that, and it doesn’t take forever like it did on the Spark. If you like taking videos and pictures of yourself doing cool things, Smart Capture is definitely a feature you will appreciate. When DJI released the Spark, they also introduced a new flight mode called QuickShots. This mode allowed new drone users to get more complex shots that would otherwise only be possible by a more experienced drone pilot. On the Mavic Air, there are six different shots to choose from. On the old Mavic Pro there were only three. You got Helix, Dronie, and Rocket, but all of the other modes were only available on the Mavic Air. The new Mavic 2 Pro has all 6 modes just like the the Mavic Air. The first QuickShot is called Dronie. This mode will make the drone fly backward and up at the same time while keeping you in the shot. 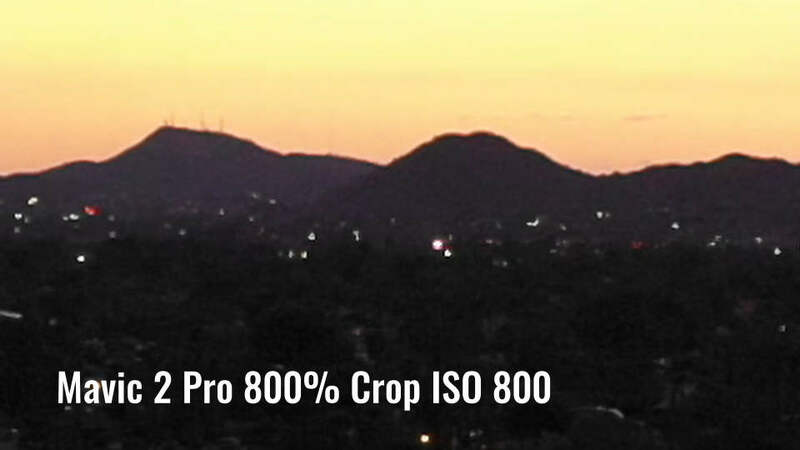 This creates a slow zooming out look, great for establishing shots that show your viewers where you are. The next shot is Circle. Like the name implies, this shot will fly in a basic circle around you. The great thing about circular shots is that you can capture them in multiple places, then cut the different shots together in editing software to get cool looking transitions from one scene to another. Helix is a lot like Circle, but in this mode, the drone will also slowly fly backward while circling you. This creates a much more dramatic looking shot than circle but requires more open space achieve. Rocket is a more basic shot where the drone flies up while keeping you in the frame. This is probably my least favorite QuickShot mode because it doesn’t look that interesting (in my opinion). Boomerang is another type of orbiting shot. This mode will fly the drone in an elliptical orbit around you. Just like Helix, it can create really cinematic shots, but also requires more space, so be careful when using it for the first time. Asteroid is the most famous QuickShot mode. You’ve probably seen it many times before. This mode creates a video that zooms out into a tiny planet effect, then it zooms back in. Asteroid shots can look really cool, but I would recommend not using it all the time or the look will get really old really fast. Obviously, if you have a lot of experience flying, then the QuickShot flight mode won’t provide much value to you, but for beginners, it’s another good feature to consider. One thing that many people don’t realize is that all of these flight modes work just like Active track. That means you can track more than just people, and the subjects that you track can also be moving at the same time. Out of all the differences between these two drones, this is the one thing that made me realize that the Mavic Air is not equal to the Mavic 2 Pro. The Mavic 2 Pro controller is just better in every way. The first thing you will notice is that the Mavic Air controller doesn’t have a screen for showing you real time flight info. This means you can’t have a clean view of your video feed while keeping all of the flight data on the controller. There’s also no exposure dial on the back of the controller, less rubber and metal, and no 5 axis joystick (the thing for controlling DJI Goggles and assigning custom functions). It’s sad to see all of these missing features on the Mavic Air controller, but there’s something else missing that you can’t see. If you’ve ever used Ocusync on the old Mavic Pro, you’ll know that it’s one of the best drone data transmission systems ever. The video feed is always clear, the controls never freeze up, the video feed is 1080p with low latency, and the signal is almost always reliable. 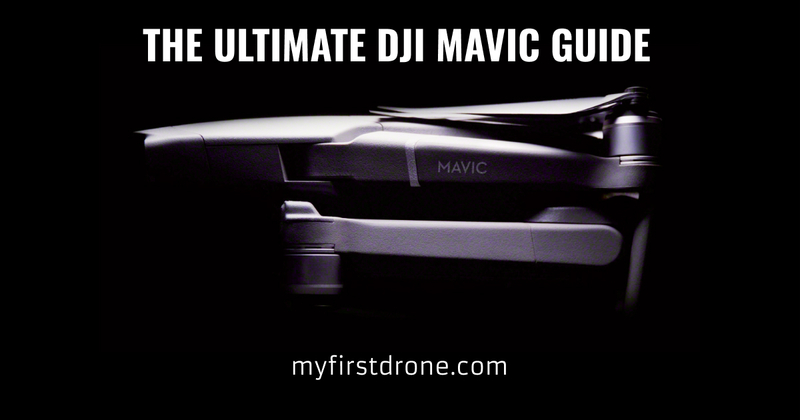 With Ocusync, the old Mavic Pro as well as the new Mavic 2 Pro controller can also wirelessly connect to DJI Goggles. With the new Mavic 2 Pro, you get Ocusync 2.0! 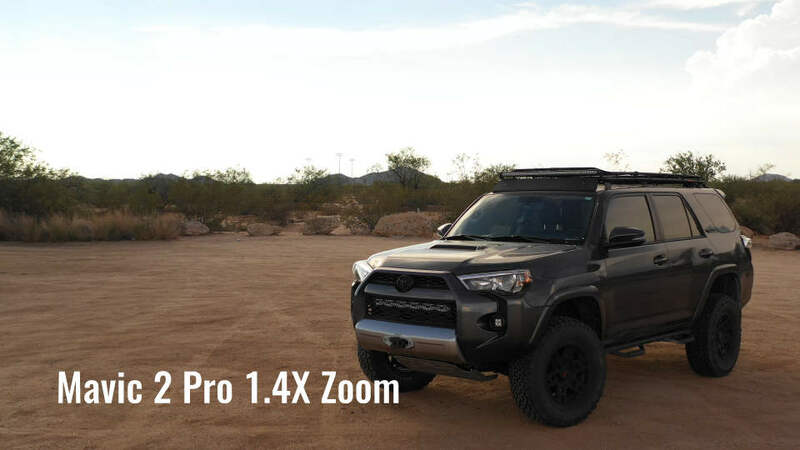 New and improved, it streams a constant 1080p video feed over both frequencies, 2.4GHz and 5.8GHz simultaneously for even better reliability and a longer 8km range. With the Mavic Air, you don’t get Ocusync. You get something that is closer to the technology found on the DJI Spark. It’s ok, but you get 720p (not 1080p), there’s more lag, the signal isn’t as reliable, and you have to connect a USB cable to the controller to use DJI Goggles. This doesn’t mean that the Mavic Air controller is bad, it’s just a big downgrade from the Mavic 2 Pro controller and for some people, this could be a deal breaker. When I found out that the Mavic Air didn’t use Ocusync, I was a bit worried that this drone wouldn’t perform how I wanted it to. With the Mavic 2 Pro, you will always have a great video feed, and that’s one of the things that allows me to get shots that would otherwise be impossible on a drone like the Spark. After the release, I saw videos of the Mavic Air where people were getting less than a mile of range before the video feed cut out, but they were all flying over cities where there’s lots of radio interference. In most situations, if I need to do a long range flight, it would be done out in the wilderness free of interference (not over a populated area), so for this range test I’m out in the desert where there’s very little radio interference and nothing to crash into. I started from about 200 feet above the ground and then flew out until the low battery alert popped up. I probably could’ve gone farther, but since I didn’t want to lose the Mavic Air like I almost did with the Phantom 4, I decided to turn around at 10,000 feet. That’s about 3.2km or 2 miles which is farther than I’ve ever had to fly when I’m not doing range tests. With the right wind conditions, I’m sure I could beat the advertised 4km, but honestly there’s no reason to fly a drone that far away. I then did the same thing on the Mavic 2 Pro and made it to 19,000 feet before getting the low battery warning. After flying back, I still had a few minutes of flight time, so realistically I could’ve gone all the way out to 20,000 feet or more. These drones did great. Both of them had near perfect video feeds even at the point where I had to turn around, but while coming back, there was just one small video glitch on the Mavic Air that lasted about a second. It was very minor though. With the battery life on the Mavic Air, realistically you can fly 1 mile out, hover around for a few minutes while you get some good shots, then fly back with no problem. With the Mavic 2 Pro, I would probably feel comfortable flying it as far as 2 miles, hovering around, then coming back. In any case, you should be happy with the video feed on either of these drones. The Mavic 2 Pro will be much better for long range flights when there’s lots of interference, but the video feed on the Air is surprisingly not bad at all. We have not done a proper latency test with the Mavic 2 Pro, but earlier in the year we did a test to see much latency the Mavic Air has compared to the old Mavic Pro and the results were better than expected. To test the latency, you just record a video of something happening and show the live feed from the smartphone at the same time. On the left you will see the Mavic Air and on the right the old Mavic Pro. Based on this test, The Mavic Pro latency is about 130ms and the Mavic Air is 170ms. These are just rough estimates, but they do show that there’s not a big difference between the two video feeds. To be honest, I was expecting much more lag due to the WiFi link on the Mavic Air compared to Ocusync. We also tested the video latency on the DJI Spark and the results were much worse. All of this means that the Mavic Air does have a much faster video feed than the Spark, but the Mavic Pro still comes out on top. With the Mavic 2 Pro, you should see about 10ms less lag than the old Mavic Pro. If you’re always using the Mavic 2 Pro controller, the Mavic Air controller will feel like a downgrade, but what if you don’t want to use a controller at all? What if you just want to use your phone? Well, there is no WiFi on the new Mavic 2 Pro so you have to use the controller. But you can control the Mavic Air with just your smartphone and it is amazing. The signal strength is really good. I can fly over 300 feet away in a densely populated area and still have an ok connection. While doing the same thing with the old Mavic Pro, I could only get about 100 feet before the signal became unusable. I really wish that the new Mavic 2 Pro still had the ability to use WiFi like the old one did, but I guess they didn’t think anyone was using it. 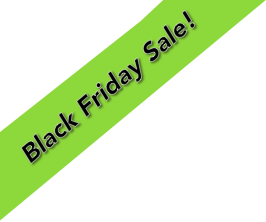 The final price that you pay all depends on what you get with your drone. With the Mavic Air the price starts at $799, but with a flight time of around 18 minutes in the real world, you won’t get very far if you don’t buy extra batteries. There are also other things to consider like DJI Care (DJI’s drone damage protection program that lets you get a new drone even if you destroy yours). If you’re serious about shooting video, you will also need ND filters. Oh, and don’t forget a case to put everything in. All of these things add up no matter which drone you get, but one thing most people don’t think about is how long they will have each drone for. If you get the Mavic Air for example, you might find that in a few months you’re ready to upgrade to the Mavic 2 Pro, so it might not always be a good idea to stock up on all of the batteries and other accessories if you’re just going to be selling it months later and losing all of that extra money you spent. With a starting price of $1,249 and $1,450 for the Pro model, the Mavic 2 is definitely not cheap. But at the same time, for 99% of the population it will be the first and last drone you buy, because there’s really nothing else out there that competes with it. Even next year when DJI comes out with a Mavic 3 Pro, most likely it will have some new smart features, but the camera itself will be almost the same. For example, the sensor on the Mavic Air is very similar to the sensor on the old Mavic Pro, which is similar to the original Phantom 4 and even the Phantom 3. It’s taken multiple years for DJI to put a camera in their consumer drone that is drastically different from the last one, so I’m expecting the next camera upgrade to be a very long time from now. If you have a small budget, obviously you should go with the Mavic Air. It’s much cheaper and it’s still a very capable little drone, but if you can afford to go with the Mavic 2 Zoom or even the Mavic 2 Pro, just do it. The Mavic 2 Pro is everything I’ve been wanting in a drone for the past three years. It finally has a large 1 inch sensor. 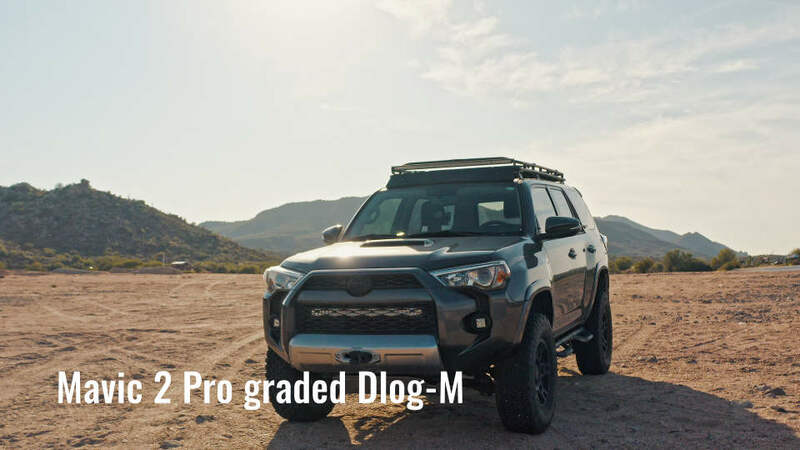 The 10-bit Dlog-M color profile makes color grading super easy and clean. The zoom functionality (whether you get the Zoom version or the Pro version) is great for isolating the foreground from the background. The increase in speed makes it even more useful for action shots. The longer flight time means that you can fly farther than ever before with plenty of time to return home. There’s so much stuff packed into the Mavic 2 Pro that it more than justifies the extra cost and you’ll be blown away by the video quality once you get the files off of the SD card and onto your computer. Just make sure you get DJI Care. With a drone at this price, it’s good to have that piece of mind.